I have to disagree WRT the water tower sequence. That's a minor classic, and deservedly so. Drowning in a water tower is a disturbing idea, and one that's familiar to millions of New York City kids. It's convincingly presented as a real threat -- deep cold water with slippery, unstickable walls. And it fits nicely with the "low level" atmosphere of these early issues, where Spider-Man could be seriously menaced by relatively simple threats. 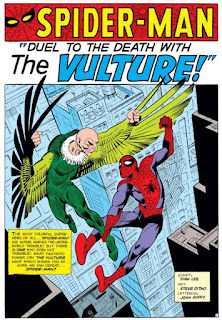 It's also helping to establish the idea that Spider-Man never gives up, which will grow in importance across the first 40 issues. 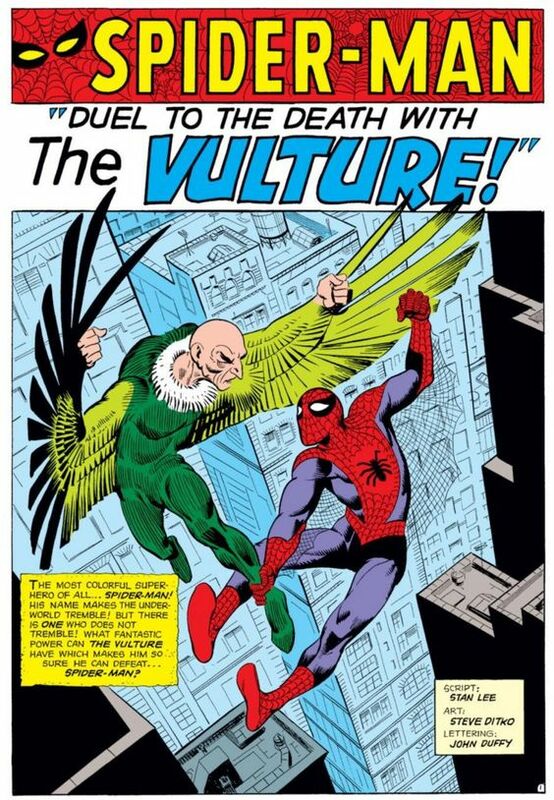 The Vulture was Spider-Man's first supervillain enemy, so it's worth pausing to consider him on that level. 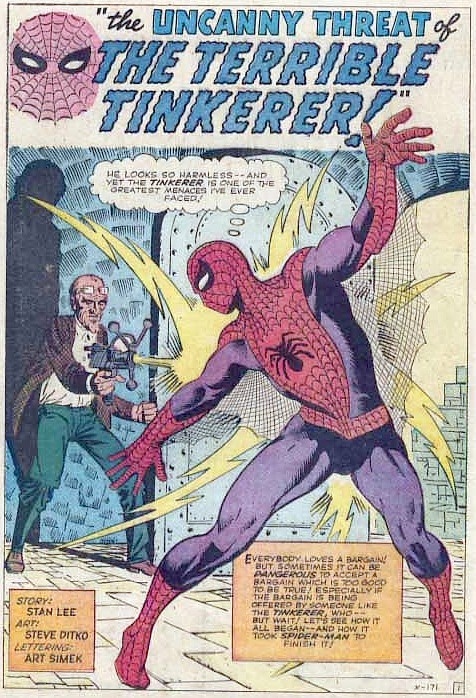 He's potentially interesting in that he could have been a foil to Peter Parker: a brilliant scientist who develops a cool device. 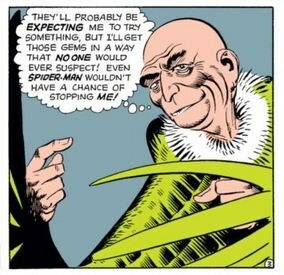 Unfortunately, he's never expanded or explored in any way. The moment he comes up with an invention, he can only think of using it to steal. He has no backstory or motivations. He does nothing but steal and gloat. 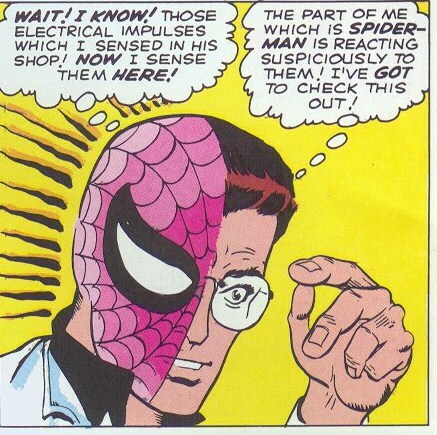 I'm inclined to blame Ditko for this -- Ditko has always loved mustache-twirling motiveless cartoon bad guys -- but Lee could at least have given him a sentence or two of personality. 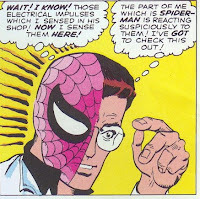 Next issue, with Doctor Octopus, he'd show some chops in this regard -- Octopus is pretty two-dimensional too, but there's the recognizable outline of a tragic figure there. The aliens in the second part are obviously, as aliens in those days so often were, Communists. The further shores of anti-Communist paranoia provided vast material for the comics writers of the 1950s and early '60s: mind control! they look just like us, but they're really monsters. Or, in this case, that harmless old man is really A SPY; that deal is too good to be true; they're in the radios.